The first World Cup following the Second World War was one of shocks. After a 21-year exile the British nations were able to take part at last, having rejoined Fifa four years before. But Scotland refused to attend and England must have wished they had followed suit following an embarrassing 1-0 defeat to the United States. The second major shock came in the final when hosts Brazil lost 2-1 to Uruguay, a defeat that still rankles in Rio and beyond more than 50 years on. Brazil's impact on the previous World Cup, held 12 years before, had earned them the right to host competition for what was now the Jules Rimet Trophy. The preliminary competition became something of a farce, as teams qualified and then withdrew. India pulled out because Fifa would not let them play in bare feet. Having joined Fifa four years before, British nations could compete but the Scots then said they would only go if they became British champions. In the end they refused to attend after finishing runners-up in the British Championship to England, who beat them 1-0 at Hampden Park in April. Having refused to take part in the previous competitions, England began their first foray into the World Cup as one of the favourites but ended it in ignimony. After beating Chile 2-0, a 1-0 defeat against the United States in Belo Horizonte shocked the world of football and the players flew home suitably chastened. Brazil, Spain, Sweden and Uruguay won their groups, the Swedish amateurs suprisingly beating Italy 3-2, and went on to play a round-robin series of matches to decide the champion. The Brazilians thrashed Sweden 7-1, Spain 6-1 and the hosts got ready to party. Their final match was against the competition's first ever winners, Uruguay. Their draw against Spain and 3-2 defeat of Sweden had left Brazil needing just a draw to win the trophy. Brazil took the lead through Friaca early in the second half in front of about 200,000 partisan fans (officially 174,000) at the massive new Maracana Stadium, which was barely finished in time. 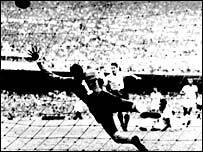 However, Uruguay drew level through Schiaffino and then Ghiggia scored the winner 11 minutes from time to maintain his country's 100% record in winning the title. Defeat was too much for the Brazilian officials and they forgot to present the trophy to the winners, leaving Jules Rimet himself to seek out the Uruguayan captain and belatedly do the honours.